If you like the idea of checking your emails from a web browser, and you enjoy the Windows Live Hotmail interface and experience, you're in luck: Hotmail lets you check other email accounts from itself. In other words, once you have a Hotmail account, you can connect to other email accounts (other non-Hotmail email accounts) from Hotmail itself. In addition to being able to check your other email account's emails from a familiar application, this also means that you only need to log in to Hotmail to check (for example) your personal email account and your job email account. Another tutorial explained how to setup mail forwarding from Hotmail: what we explain here isn't mail forwarding, it is actually allowing and setting up Hotmail to check mail from other email accounts. In order to use Hotmail to check other email accounts, you do need to have at least one email account: if you don't, or if you wish to use a new account, learn how to create a Hotmail account. Update: the next steps in this tutorial still work to add another email account to receive messages from another source, but you can now click on the gear icon in your inbox, and choose "Get e-mail from another account" in the submenu. 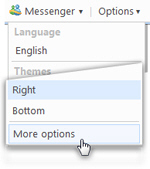 To send and receive emails from a second email account, right from Hotmail, click on the Options menu in the top right of your main Hotmail window. Click on More options to configure your Windows Live Hotmail account settings. Hotmail will load the next screen that contains two sections: under "You can receive mail from these accounts", you can setup other email accounts Hotmail will check for new mail. And under "You can send mail from these accounts", Hotmail lets you setup other email accounts from which you can send emails right from Hotmail. In the next screen, Hotmail collects your email address and password; before entering them, click on the Advanced options link: this will reveal other settings you can setup for the other email account. 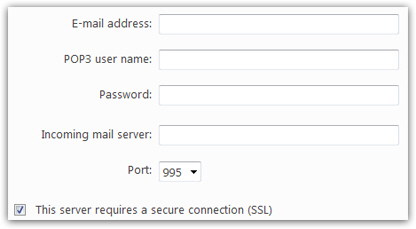 The advanced screen collects your email address, your POP3 user name (which is also your email address in most cases), your email act password, the incoming mail server and the port number, and whether or not "This server requires a secure connection (SSL)" (a safer option, but not supported by all email providers). These values will of course vary based on your other email provider's recommended and supported settings. The one setting, enabled by default, that matters perhaps most, is the "Leave copy of my messages on the server" checkbox: if you uncheck it, Hotmail will download these emails to your Hotmail account, but remove them from the original mail server; if you leave this checkbox checked, as we'd recommend, Hotmail will only download a copy of each new email, and leave the original emails on the server. The only time you should really uncheck this option is if you intend to check this other email account exclusively from Windows Live Hotmail. Fill out the credentials Hotmail requests for the other email account and click Next. The first option lets you determine where Hotmail will store the emails that arrive from your other act: by default, these emails will be stored in a new, custom created folder inside your Hotmail account: you have the ability to name the folder whatever you like by typing a new name inside the A separate folder called text field. Alternatively, you can choose An existing folder, and pick one of your Hotmail folders from the dropdown menu. We will keep the default choice automatically set by Hotmail. With the second set of options, Hotmail lets you assign a custom icon to all emails that arrive from other email accounts. If Hotmail successfully connected to your other email account, it will display the confirmation message shown below. Click on the Go to inbox link to check your new email messages. From now on, Hotmail will automatically check the other email account you just setup whenever you login to your Hotmail account. If you reply to any of these emails, however, your Hotmail email address will be used; in another tutorial, we will show you how to send -right from your Hotmail account- emails using a non-Hotmail email account (the one you just finished setting up or another one of your choice). If the Status notice for the email account in question says "Last check was successful", it means problems, if any, are likely not on Hotmail's end, but with the other email account. Hotmail will give you a last chance to keep this email account by displaying the following confirmation message: '' We only recommend that you delete this account if you're really done with it. If you just want to change some settings, try editing it instead. [tutorial note: by clicking the Edit link] Deleting and re-adding can take a while and once the account is re-added, you may end up with duplicate messages. Are you sure you want to remove this account? " This will of course only remove from Hotmail the reference to the other email account, and will not make any changes to that other account. Likewise, you can later on add that email account back into Hotmail if you change your mind! Note that removing a third-party email account from Hotmail will not automatically delete the folder in which these emails are stored, nor will it delete (copies of) emails that were downloaded by Hotmail from that email account.